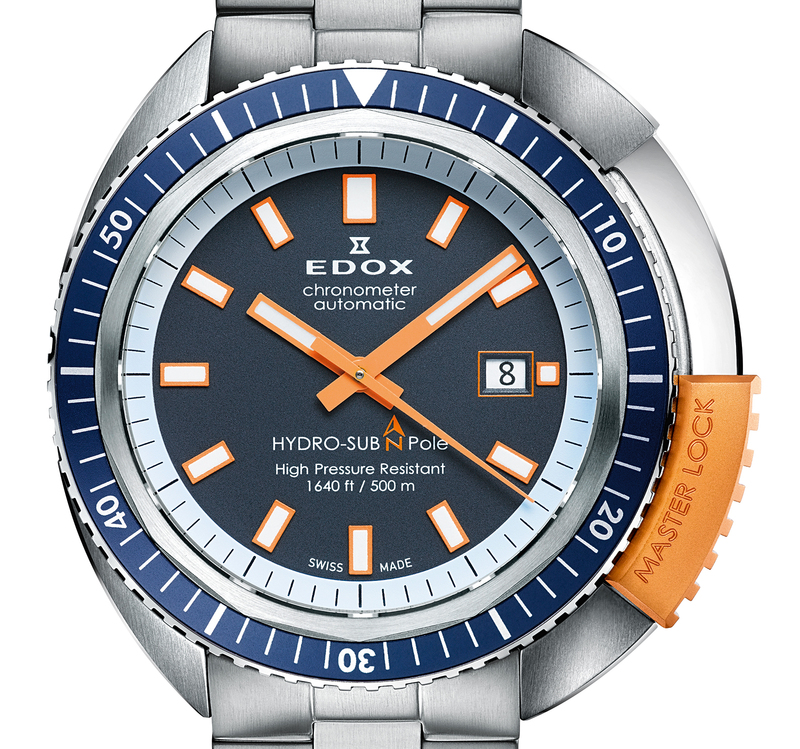 The Edox HydroSub North Pole "Master Lock"
Edox has developed a diver’s watch that has retro styling from the HydroSub produced in the 1960s, with a new twist. The 2014 HydroSub North Pole comes in a stainless steel cushion-shaped case, similar to the original, but with the new “Master Lock” crown protector system that consists of an orange metal protector that slides upward to reveal the screw-locked crown, and down to lock in place and protect the crown. 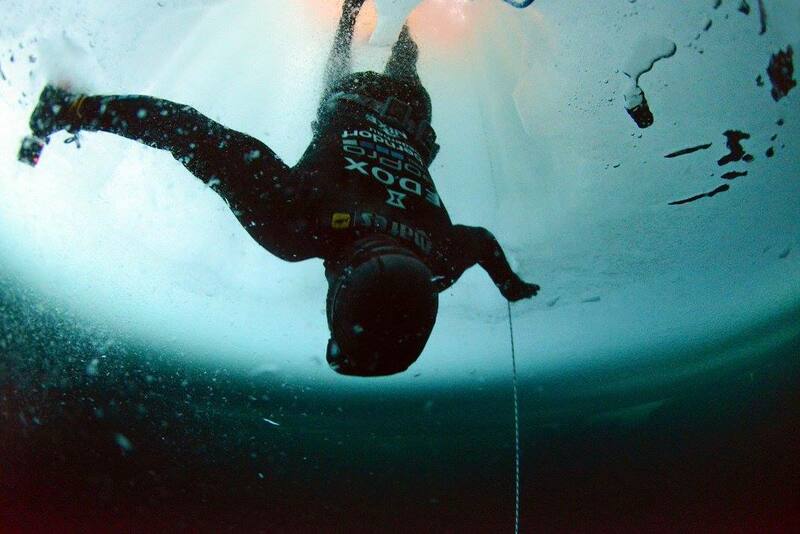 Austrian diver, Christian Redl, will attempt to become the first person to free dive under the ice of the North Pole in 2015, with the HydroSub strapped to his wrist. The HydroSub comes with a dark blue dial, with contrasting orange hands and indices. The hour hands, minute hands, and indices have a white luminescent treatment. A date aperture is located at 3 o’clock. The silver-white colored flange features a printed minute track. Inside, is a self-winding chronometer grade ETA 2824, as denoted by “chronometer automatic” on the dial. The unidirectional dive bezel features a blue insert with a 60-minute dive scale and a luminescent triangle at 12. The watch measures 46 mm in diameter (not including the crown protector), and 49 mm with the crown protector. It is 14 mm in thickness and weighs 220 grams. While the sliding lock prevents anything from touching the crown, it is the thick gasket sealed sapphire crystal on the front and the solid screwed-in steel caseback, along with a crown that has a double o-ring, which protect water entering the case — not the sliding protector. Water-resistance is 500 meters (or 1640 feet). 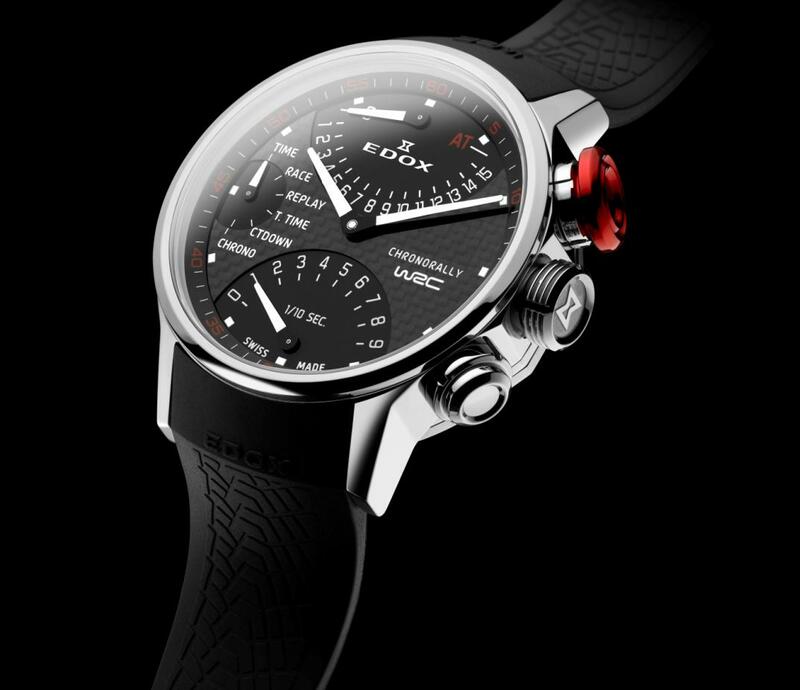 The Edox HydroSub North Pole comes with a steel bracelet and a leather strap and will be available in a limited edition of 350 pieces, at a price of approx. $2900. Next articleHYTThe HYT H1 "Velvet Gun"